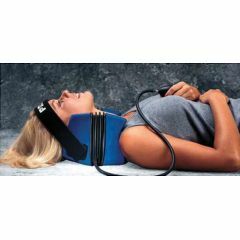 The PRONEX Cervical Traction Device is easy to use, comfortable, non-threatening, portable, weighing less than 2 kg. No assembly, no weights, no cables, no springs or levers. PRONEX is user friendly and restraint free. Pronex reduces the need for costly pain medication. PRONEX Pneumatic Cervical Traction Unit helps break the pain cycle. PRONEX has unique design which provides anatomically correct traction Supports the natural curve of the cervical spine and provides an even distraction in the anterior and posterior cervical discs. PRONEX does not aggravate the temporomandibular joint. Encourages regular use by the patient at home, helping to break the chronic pain cycle. Professionally conducted surveys prove that PRONEX relieves pain, promotes the healing process, and helps patients resume normal work and social activities. PRONEX pays for itself: Reduces pharmacy bills, minimizes lost workdays, and often eliminates the need for ongoing office visits and drawn-out physical therapy. Patient manages pain control at home. To size, measure neck circumference. Due to often short recovery times The Pronex is non-returnable. Pronex offers a unique design which provides anatomically correct traction. The Pronex also supports the natural curve of the cervical spine and provides an even distraction in the anterior and posterior cervical discs. Does not aggravate the temporomandibular joint. Portable, comfortable and convenient. No assembly, no weights, no cables, no springs or levers. It's restraint free. Encourages regular use by the patient at home, helping to break the chronic pain cycle. Pronex cradles the reclining patient's head and neck on two soft foam cushions. One cushion supports the occiput and the other rests against the upper trapezius. An air-inflated bellows between them provides up to 30 lbs of continuously adjustable traction. As the bellows expands, it lifts the head upward supporting the cervical curve and maintaining an even distraction in the anterior and posterior cervical discs. Patients have total control over the amount of traction applied. Squeezing an inflator bulb increases the pressure, a release knob gently reduces it. There's no strain on the temporomandibular joint. Reduces pharmacy bills, minimizes lost workdays, and often eliminates the need for ongoing office visits and physical therapy. Patient manages pain control at home. Pronex is the only traction device that creates an even distraction in the anterior and posterior cervical discs while supporting the cervical curve. One year, (all parts and labor) see manual for instructions and additional warnings. "I have had a lot of success with this device, prescribing Pronex for over 400 patients. Before deciding on surgery, particularly for elderly and high risk patients, I commonly prescribe a 2x day regimen for at least six weeks to determine if traction will relieve the pain. In many cases it does. I get paid to operate but this is a very good device that can help some patients avoid the need for invasive surgery." "Patients with tension headaches with a cervical component, especially chronic users of analgesic or sedative medications, may be helped by the Pronex. This device may enhance or shorten P. T. visits and replace medications." "Perhaps the most dramatic finding is that, unlike many cervical traction devices, the Pronex does not tend to pull the spine into a straight line; instead, it offers even spacing between the vertebrae and avoids jamming trauma in the anterior muscles and disk spaces." "The Pronex unit was the only successful application of cervical traction for one of my complicated patients with the diagnosis of cervical discogenic spondylosis with marked myofascial irritability and right C6 radiculopathy'. Therapy work with this patient was prolonged and quite slow secondary to the extreme tissue hyperirritability and severe pain. At one point there was serious consideration for surgical intervention given the difficulty of this patient's condition and the significant impairment to her quality of life. The Pronex trial was so successful that it allowed her to resume the requirements of her career with much greater ease and comfort." "We will use this device in our presentation on cervical dysfunction and treatment. This is an ingenious device." "From these encouraging initial results we have concluded that Pronex use is a very beneficial adjunct to conservative management for patients with a variety of cervical spine conditions. Especially significant is the apparent success we have experienced using this device with patients exhibiting chronic pain of spinal origin." "A few months ago I had the good fortune of evaluating the Pronex cervical traction unit during a trial period at our clinic and was most impressed with both its effectiveness and ease of use for the patient. The patient controlled pressure level eliminates the fear associated with most over the door home units and prevents the common side effect of TMJ pain." "Thank you for the Pronex supine cervical pump traction units you sent to our facility for clinical trial. We have been using the Pronex for our patients with neck pain and headache with good success. Therapists report using the Pronex to replace manual traction as well. Therapists also report that the Pronex is successful in relieving tension headache through pressure on the occiput. The portability and ease of use of the Pronex make it a valuable addition to our department." "We have been amazed with the almost instant acceptance of this medical equipment by therapists and doctors. We have to work hard just to keep up with the demand for the Pronex. Even the insurance company representatives who have seen the Pronex are excited about its potential." "For the independent, self directed person, the addition of the Pronex to their options for handling spinal dysfunction is welcomed. We see many persons using Pronex rather than medications, or repeat courses of physical therapy. In addition, regular application of this device often leads the user to increased awareness of muscular tension and postural imbalance." "To compliment the rehabilitation section of our Cervical Spine symposium program we were in search of a device that could provide the benefits of axial traction to the cervical spine while improving and supporting the normal cervical lordosis. After reviewing numerous products on the market, we chose Pronex." "The authors conclude that all the devices tested were capable of distracting the cervical spine, attaining greater separation at the posterior disc height than the anterior....Based upon the survey results, it appears that the Pronex device is the clear choice among the subjects tested. It scored favorably above all the other devices." 84% of the patients rated Pronex "Good to Excellent" for an overall rating. Comfort and ease of use are key advantages of Pronex therapy. 88% of patients rated Pronex "Good to Excellent" for the ability to achieve desired amount of traction. 91% of patients rated Pronex "Good to Excellent" for ease and convenience of use. Pronex excels by utilizing a lightweight, user friendly design that encourages patient compliance and a way out of the chronic pain cycle. 72% of the patients reported a reduction in pain interference, enabling them to resume normal activities, including returning to work. 76% of patients reported a reduction of pain interference with daily activities. 59% of patients originally on pain medication reduced or eliminated its use. Reducing pain medication improves the patient's quality of life and saves money. The A&A Research patient satisfaction survey and several papers from the medical literature (1) confirm that Pronex therapy is highly effective for managing cervical pain. It helps minimize lost workdays, speeds the rehabilitation process, and helps restore confidence and self-esteem. It often pays for itself by reducing pharmacy bills and eliminating the need for long-term physical therapy. Over 80% of patients continue to use Pronex regularly to maintain cervical stability. "I am very happy to report that the planned surgery (C6-C7) was avoided and my neck, shoulder and arm have improved so much that I cannot even detect pain in any position. It's amazing to me that I cannot detect any symptom and that I can rotate my head equally as far to right and left. A large measure of credit goes to Pronex." "I have not had any treatment whatsoever since I purchased Pronex and I am elated to tell you that the pain and pressure are gone and the feeling in my arm has returned. With the exception of the outside edge, the feeling has also returned to my hand. Without Pronex this never would have been possible." "In mid July, I met the distributor of the Pronex traction unit and he suggested that I try one. I got a prescription from my physician and borrowed the Pronex unit to try. The Pronex traction unit is comfortable, easy to use. and effective. Today I am pain free. I would strongly recommend it to anyone needing home or portable cervical traction "
"I suffered for 6 months with neck, shoulder and arm/hand pain due to three herniated discs in my neck. Your product has helped me to live a "normal" life again. I tell everyone I see with a neck collar on to ask their doctor about Pronex." Comment: I'm a 40 yr old radiologist who had a C5-6 fusion 18 months ago and was worse after surgery than before. My neck/scapular/shoulder and forearm pain had become intolerable and I had stopped upper body excercising and playing guitar. A desperate net search led me to try your product, which I've been using religiously for about 4 months, for 15 minutes, 3 times a day. Wow! This thing has given me new life and provided great relief of symptoms. Thanks! Comment: I have arthritis of the spine with severe degeneration of several vertebral disks. 10 years ago I started getting migraine headaches that have progressively gotten worse and more frequent over the past 3 years. After several months of physical therapy, muscle relaxer and pain medication, my doctor has ordered home cervical traction for relief of my severe head, shoulder and neck pain. After using the Pronex 2X per day for 2 weeks now, the pain in my head, neck and shoulders has been greatly reduced and I have had no migraine headaches. The Pronex cervical traction has been a real lifesaver. Comment: This thing has relieved almost all of my neck pain and about 75% of the tingling and weakness in my arms. I was going to have micro surgery to remove bone spurs but it looks like I may not have to after all. Very good! Comment: After suffering with limited motion and pain in my shoulder and neck, I realized that without some outside guidance I would be unable to continue my active participation in the sports that are so much a part of my life. I am 67 years old and the father of 8 year old twins and a 3 year old daughter. Obviously there is no room in my life for a pain and immobility. My close friend and Orthopedic Physician, Dr. John Stamelos of Buffalo Grove, Illinois, evaluated my condition and prescribed a Physical Therapy Treatment Plan coupled with at home use of the PRONEX Pneumatic Cervical Traction System. Although the Physical Therapist had never seen the Pronex before she eagerly worked with me to implement the prescribed program. The Pronex representative came to the Highland Park Hospital to demonstrate the proper use of the Pronex and we began the treatment plan. Every day,after treatment, I felt less pain and was more flexible. My range of motion increased beyond my staring point and after 8 weeks I was pain free. I have used the Pronex in a maintenance program and have been continually pain free for over one year. My golf game has become more consisitent and I've lowered my handicap to"8". "CONRATULATIONS GLACIER CROSS". Comment: About a year ago you exchanged our Pronex unit for a smaller size. Thank you so much, after we fought with the MD that originally ordered it, you got us the new size with no trouble at all!!!! You have a great customer relations department!!! The unit works great and my husband is feeling much better!!! Comment: I have been using the Pronex traction device since July 2000, and I find it not only relieves my neck pain, and reduces spasms, it also enhances my mood. I have osteoarthritis in my neck - which means some of the disks degenerated and there is scar tissue in my neck muscles. My rotation is less than full range and spasms often occur. Now with occasional use of Pronex, spasms are reduced, and my neck mobility is increased. As a result of this, my overall mood is boosted. I find myself needing to use it less now. Perhaps the spasms are occuring less often because of my occasional use of Pronex. Comment: I received my pronex (which took only 2 days to get from Montana to England) and after the first use I got an immediate 90% reduction in the excruciating pain which had been constantly travelling down my arm and shoulder. So great was the relief that, for the first time in 3 weeks, I was able to forget the pain killing tablets. I am now confident that given a little more time my cervical spondylolosis of C7 will be given its marching orders! Thank you so much, Kyle and your team. If ever you are in England and near my pub the beers are on me! Comment: Dear Sirs: I have been an appreciative user of your Pronex cervical traction product for the past approximately 10 years. It was first demonstrated to me at the office of our physical therapist here in Portland, OR. I was immediately impressed by the simplicity of the design and despite initial skepticism, I had to admit I could feel actual traction occuring between my occiput and the cervical segments. Before retirement, I had practised diagnostic radiology for more than thirty years. Long hours of squinting at view boxes to interpret plain films as well as monitors for CT scans took their toll on the cervical unco-vertebral joints and disk spaces. It appears that there may be some genetic, as well as occupational predisposition. Dorsiflexing and extending the neck will cause some ""buckling"" of the posterior ligament (lig. flavum) thus reducing the available volume of the spinal canal space. This occurs especially in the age-group wearing bifocal correction. In any event, Pronex has proven to be a reliable device in my own case, affording relief in non-emergent situations at home, as well as on vacation, enhanced also by preliminary application of some moist heat to the neck. Maximum relief in our case was obtained after a relatively short time of 10 to 12 minutes. Congratulations on a cleverly designed and effective product. Comment: To whom it may concern: I have used the PRONEX cervical device for over 3 years, after I had a car accident, where I was rear-ended. I initially received the over the door traction device and was instructed to use it twice a day. It was not only primative in design (aka. Frankensteinish!! ), but difficult to use for an injured person. After using the over the door traction device for a few months, I developed TMJ in my jaw. I then went to another treatment center where they prescibed the PRONEX. I had immediate improvement in my neck. PRONEX is easy to use and RELAXING. My neck immediately feels better after each use. The best thing is I can use it when I am home alone, as opposed to the over the door traction unit, which I considered unsafe and puts too much pressure on the jaw. The PRONEX is safe and I look forward to the instant relief it gives me. A plus is one can travel with it and use it anywhere. Thanks!! Sincerely Randy Ottenberg. Comment: I have had a Pronex unit for some years and it has been a very reliable, effective, and trust-worthy friend. Comment: Our clinic has provided rehabilitative chiropractic care in the Streetsboro, Ohio area for more than sixteen years. During that time, we have worked with a variety of complicated cervical traction devices. Several months ago, we changed our approach. We began to use the Pronex traction unit to treat our chronic cervical pain patients. We've found that its restraint--free pneumatic traction helps relieve pain for patients troubled by nerve impingement, herniated discs, spondylolysis, hypomobility, degenerated discs, and joint pain. What a pleasure it is to work with Pronex. I especially like the fact that there are no cumbersome weights, cables or springs to operate. Its user-friendly design encourages patient compliance, helps promote healing, and encourages patients to resume daily activities. The successful use of Pronex by chiropractic colleagues prompted me to overcome my initial doubts about this simplified form of traction. From the first time I used it, your product impressed me with its effectiveness. My patients are grateful for the real relief it provides. Comment: While playing racquetball I ran my head into the wall and compressed my vertebra. I also herniated two cervical disks that caused severe pain in my neck and right arm. I began a regiment of anti-inflammatory medication, pain pills and seeing my chiropractor every other day. Nothing worked until I came across Pronex while researching my injury on the Internet. I asked my chiropractor for a prescription and than purchased the Pronex Traction device. I began using the Pronex and I have been amazed by the results. I could not be more excited and I now believe I will be playing my favorite sport again, thanks to Pronex. Comment:Our office was most pleased with the response and immediate action taken by the personnel of Glacier Cross when we reported a problem with our Homestretch instrument in the past. When one of the valves popped out, they replaced the whole pump unit for us. Recently, however, there was an internal problem with our unit. Expecting a hassle, we were pleasantly surprised when we related our difficulties to the president of the company. She suggested we talk with their service manager, Kyle. We discussed the dilemma with him on a Monday, and he said he would send us a whole new replaceent unit. We almost fainted when it arrived the very next day. What a pleasure it was to be served so quickly and effectively. We have been using their Pronex cervical units for some time now, with great patient satisfaction. It is gratifyng to have a company address and correct or replace equipment quickly and without question. Comment: I was selling your Pronex in the Tampa airport yesterday. I was showing a girl how it worked and drew a crowd. I think some more people will contact you. I have been using it for a few weeks and I'm a lot better. G.W. Comment: Dear Kyle, Two years ago I was diagnosed with a bulging disc in my neck. I couldn't function to the point of even driving a car. A shot of Cortizone was suggested. It wasn't risk free. I was terrified. Even an operation was talked about. Physical therapy was performed but after a short time the problem came back. I didn't know where to turn. I was using a traction bag hung over my bedroom door. It helped, but was a very harsh treatment. I explored the yellowpages of my phone book for local hospital supply stores, and I started callin them.The Clayton Surgerical Supply Co.infromed me to my surprise, that they had literature about the Pronex Neck Traction Unit. I showed the literture to my Orthopedic Doctor.She oked it to my insurance co. As soon as I started using it I had instant relief. I was able drive again immediately. Using the Pronex unit along with other conservative action has allowed me to funtion again and to lead an active lifestyle. I will recommend this product to anyone that I feel can benefit from it's use. THANK YOU GLACIER CROSS for making this fantastic product available for people like myself. Reguards, Harold J. Doebel Ocean Gate, N.J. Comment: Having used your Pronex device as per my doctor's recommendation for the last week, I thought it only fair that I take the time to write you in appreciation for your development of this product. I came to find you through a doctor's recommendation when an MRI of my cervical spine showed disk degenrative desease in C3,C4,C5,C6,C7- and bone spurs through thte same area. Over the course of the last 15 years, I have sustained a number of injuries whose slow healing curves have caused a great number of physicians, therapists, acupuncturists, massage therapists, and close friends, to ponder the enigma of my pain and disfunction (left and right shoulders, lower lumbar, atrophy in specific areas of large muscle groups). I have been extremely athletic up until the last year of my life. I always have maintained solid aerobic conditioning, strength training, and disciplined eating habits. Though diminished coordination and balance were making all efforts the more difficult. Unfortunately, at the age of 14, while working out in a gym, my head was ripped back in one of those old Nautilus neck machines whose weights had been greased before my use. Several extra weights stuck to my chosen stack. The results were not pretty. My father, not wanting to make a scene in a gym owned by his friends, discouraged me from complaint or treatment at that time. The next baseball season found me going from the number one draft choice in my age group in a competitive devision in San Diego county, to a guy who had a difficult time tracking the ball when he ran. I still remember my confusion when I could no longer run down what had been only the year before, an automatic play. I continued to play Football where I would unflinchingly go head-on with anyone who would try me. This undoubtedly did not help the neck injury. Doctor's and complaint were not easily tolerated around the Irwin house-- So I just kept my head down, and kept trying. I began getting really sharp headaches when I would try to add weight to any excersize that involved my upper body. This did not stop me. I once tried to see how bad it could get while I did some really heavy bicep curls, and found myself unconcious on the gym floor. -- Not too bad as there were several beautiful attendants demonstrating concern. Rock climbing, soccer,football, surfing, skydiving, tennis, golf, running, bicycling, laCrosse: All of these were practices of mine. Reckless abandon seemed my mantra. I did not "play" these sports as my general pain level was so great that there was little joy in the "play". I defied my pain in these practices. My own idea of victory was my purpose, -adrenaline a wonderful bi-product. My friends have always been a little nervous of my intensity on the field of play/battle. All of this pain I have carried caused me insomnia, poor attitude, diminished energy and health, and all kinds of self doubt. I have thought,"What emotional experiences have imprinted me with this perception of pain? If I am really perfect in all that I do, perhaps I will deserve the reward of being relieved of this pain.- etc..." As a part-time professional musician, I have had to work around a disfunctional articulation from my right hand. Weakness and numbness for years have travelled down my shoulders and arms, forcing me to develop a great system of "hammer ons and pull-offs" with my left hand to make up for the lack of speed with the right. Shoulder injuries, low back injuries, head aches, pains travelling through every muscle system in my body, fibrotic-crunchy material evident from my head to my toes: these have forced me finally to give up everything for the last year. -- No more 150 miles/week bike riding.- No more surfing. Quit the tennis team after winning my last two tournaments (and winding up immobilized for a week after each), no more running with the dogs, no more swimming my daily 1000 meters. No more golf, no more surfing... I finally realized that life is not worth living mizerably. If I get a little bit fat, my ego would just have to accept it... My level of constant pain had just grown to high. Having used your Pronex for the last week, I have found windows of being PAIN_FREE! Immediately, after stretching (perhaps a little too aggressively for the first couple of days), I felt my muscles relax to accept a balanced posture in my neck. When gravity comes into play (standing) I am sorry to learn just how high a price I have paid over the last 22 of my 36 years. My Acute pain level is greatly diminished already. I still feel chronic pain when I am walking around. But, if I maintain the posture that the Pronex is teaching me, my tendancy to fall into the "old" posture which my body adapted so as to best "protect" the injured area of my neck, results in immediate feedback- sharp pain. this reminds me to maintain posture, and to continue to use the Pronex device. When I am using the Pronex, it is the only time that I can remember that I have been completely pain free at any time in my adult life. The fibrotic material in my muscles has significantly desolved. I am sleeping better than I have ever before slept. I have movement in areas of my upper back- and shoulders, and lumbar area which lead me to conclude that the great majority of injuries I have sustained in the past, were a result of imbalances in my body, caused by the protective posture I had adapted in my neck. I am not out of the woods. 22 years of severe pain can not be eradicated over night. However, I could not be more pleased with your product or company. I am religiously applying traction several times per day. And, I am using really light (5lb) weights to slowly strengthen my shoulders and arms through a range of motion which prior to my using this Pronex device, would have been impossible. I don't know that I will be surfing the big waves ever again. My goal is to experience life without pain. I may have to become some fat, meditative guy to do it, but that is certainly a step up from the pain generated, semi-suicidal rage I carried on a daily basis. Thank you so much for your work. Aloha from Maui, Joseph Irwin. My Pro-Nex is about 12 yrs old and is leaking air. May I submerse it in water to try to find the leak or do you repair? Can I purchase replacement billows for my pronex serial # 107020158? Where and what is the cost? Will this qualify as a medical expense for an FSA account? Does the Pronex 1 cervical traction device contain any components made from Latex? My wife has a prescription from her Neoursurgeon for a cervical traction device. Are these devices covered under Medicare?